Synopsis: The year is 2009. Nineteen-year-old Jackson Meyer is a normal guy… he’s in college, has a girlfriend… and he can travel back through time. But it’s not like the movies – nothing changes in the present after his jumps, there’s no space-time continuum issues or broken flux capacitors – it’s just harmless fun.That is… until the day strangers burst in on Jackson and his girlfriend, Holly, and during a struggle with Jackson, Holly is fatally shot. In his panic, Jackson jumps back two years to 2007, but this is not like his previous time jumps. Now he’s stuck in 2007 and can’t get back to the future. Forget everything you know about time travel. It's 2009 and 19-year-old Jackson Meyer can travel through time, but it's nothing too exciting; until the day he gets stuck in the past. This book is interesting because it falls more into the New Adult category than Young Adult. Our protagonist, Jackson is a student at NYU and falls into the older side of YA protagonists at 19. His girlfriend Holly, an NYU freshman, doesn't know he can time travel and is the basic pretty, middle class girl with standards and modesty about her success. I knew this book has lukewarm ratings so I was hoping the audiobook would help me like it more. I found the narrator to be spotty and at times his voice for a character would become inconsistent. Some of his voices were even kind of annoying. His voice for Holly's friend Jana was just so ridiculous I couldn't take it seriously. This is where my biggest pet peeve comes from. Jackson doesn't do anything to actively try and save Holly. For a while he just chillaxes in 2007 and tries to date the 17 year old version of Holly. Jackson is relatively weak as the novel's protagonist here. A lot of the time he is protected and treated like kid and not a 19 year old. When he makes discoveries about his origins it just doesn't make sense that no one would have told him. This novel reminded me of Breaking Dawn in it's structure. It is so cluttered by odd moments, side stories and characters. Some people rated this book low because the time traveling wasn't made super clear and while that was confusing it isn't what bothered me. I mean up until the end the time traveling is pretty straightforward. The book includes dates for some chapters to help clear up timeline. The ending did end in kind of a cliffhanger and with a lot of loose ends so, I think I will continue with the series. I really liked this one, but then again, I did read it, not listen to it. I thought it was very well-done and I'm interested to find out what happens next! 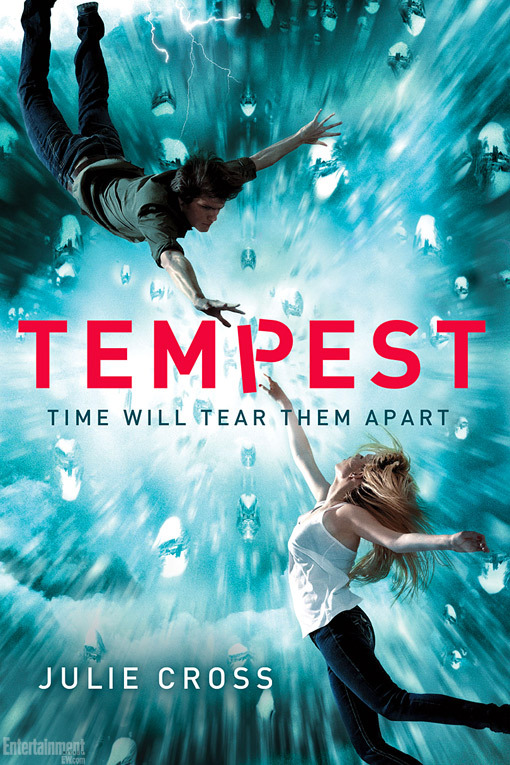 I have the audiobook to Tempest and tried to listen to it. I was really confused about the time travel from that, so I gave up and went to the book. It was a lot easier to understand it when I actually read it. I really liked the book, but I can understand where you're coming from. It was kind of irritating that Jackson didn't do anything in 2007 but just tried to get with 007 Holly. I wanted to shake his character sometimes so he would try harder to get back to 2009. I'll definitely be reading the sequel, but I'm not sure where Julie Cross is going to take the series. I'm still interested in what happens next, but overall I just don't think this was the book for me. Ugh, it's hard when you get an audiobook you don't like. There isn't much you can do with it. I agree there were times when I thought it would be easier to read the book verison.